How Deep Is Your Love: The Bee Gees’ first hit song for “Saturday Night Fever” still defines the Disco Age. This is the later of two official music videos performed by the Bee Gees of How Deep is Your Love. 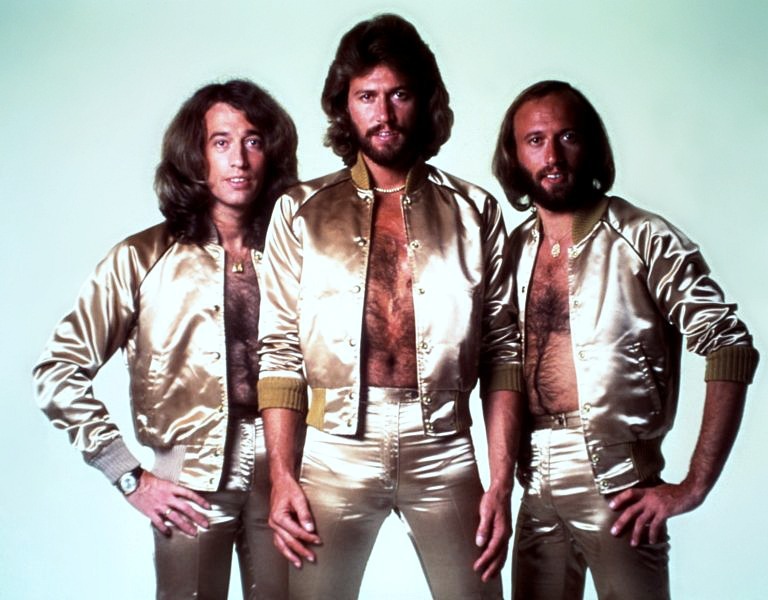 The music of the Bee Gees (left to right: Robin, Barry, and Maurice Gibb) and the 1977 film Saturday Night Fever starring John Travolta breathed fire into the disco music craze and helped define the disco era in the late 1970’s. 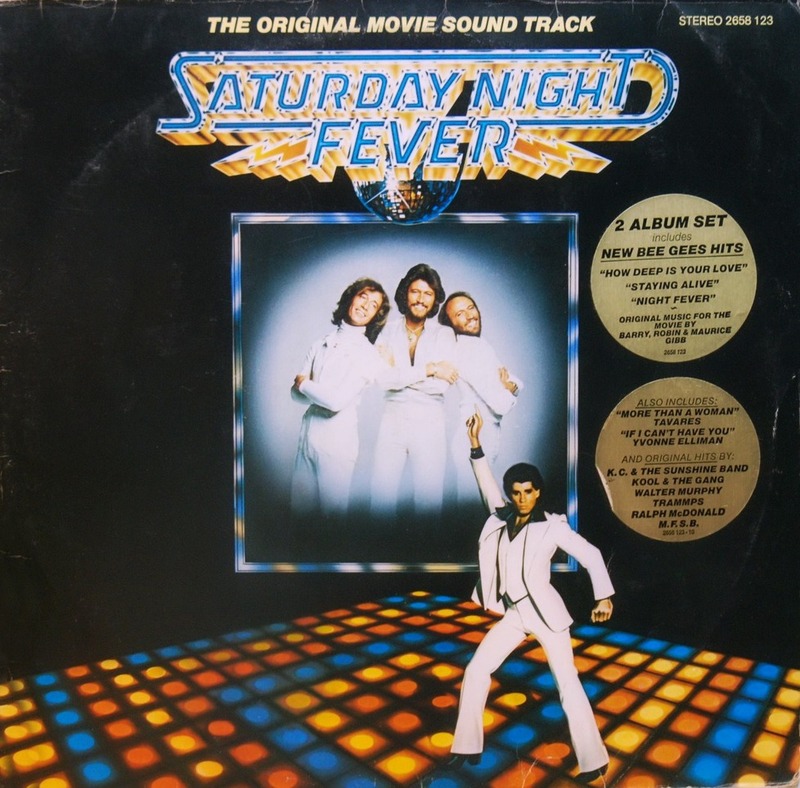 A huge international pop music hit starting in late 1977, How Deep is Your Love written and performed by the Bee Gees made its way into the Saturday Night Fever: The Original Movie Sound Track album that went Platinum on January 3, 1978 and was certified 16x Multi-Platinum on November 16, 2017. It remains one of the top ten-selling albums of all time. When the Bee Gees were asked by film producer Robert Stigwood to provide five songs for a film tentatively titled Tribal Rites of the New Saturday Night based on the 1975 New York magazine fiction article about the urban disco scene, they didn’t want to compose music specifically for a film (although Barry did write the title song for Stigwood’s follow-up picture, Grease). It didn’t help that the Bee Gees were given neither a script nor hardly told what the movie plot was about. They offered Stigwood, their longtime manager, songs that they were already working on, namely, Stayin’ Alive, Night Fever, If I Can’t Have You (later sung by Yvonne Elliman), More Than A Woman, and How Deep is Your Love.5 At one early screening with John Travolta and director John Badham, among others, the Bee Gees were pleased though a little surprised when they saw for the first time scenes of the re-titled Saturday Night Fever with their music and lyrics to back it up. Although the music soundtrack at this juncture was demo cuts, the songs they wrote and performed meshed perfectly with the film’s scenes about which they had never been told very much. To be added to their astonishment—as much as anyone else’s there attending that rough cut – is that the Bee Gees had no idea they had embarked on a motion picture that would soon prove to be a milestone in film history. 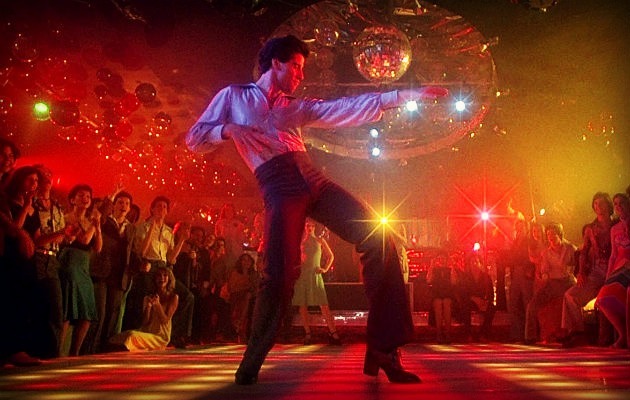 Saturday Night Fever would perfectly capture a moment in time and forever define the disco age. John Travolta arriving at the London premiere of Saturday Night Fever on March 22, 1978 with companion Kay Edwards. 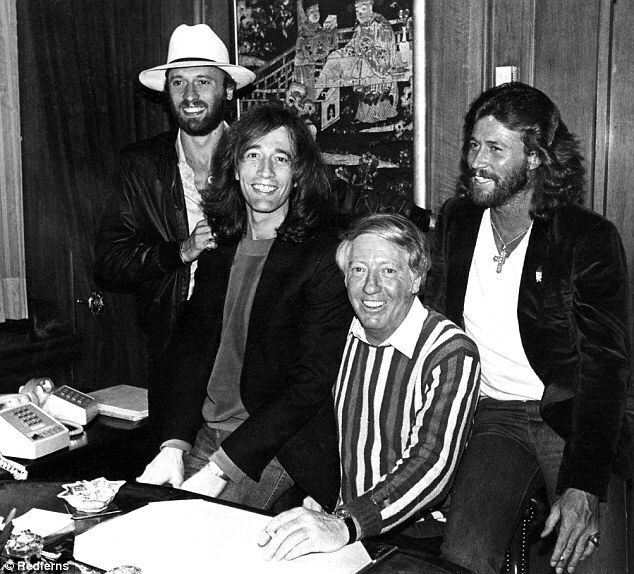 Producer Robert Stigwood with the Bee Gees at the peak of their careers. Australian Stigwood managed the English-Australian pop-rock band for a decade before Saturday Night Fever launched them into global superstardom. Tony Manero’s shiny white polyester suit – bought off the rack in Brooklyn for the making of the film Saturday Night Fever- has been compared to a symbol of aspiration and hope in what is otherwise a dark movie. 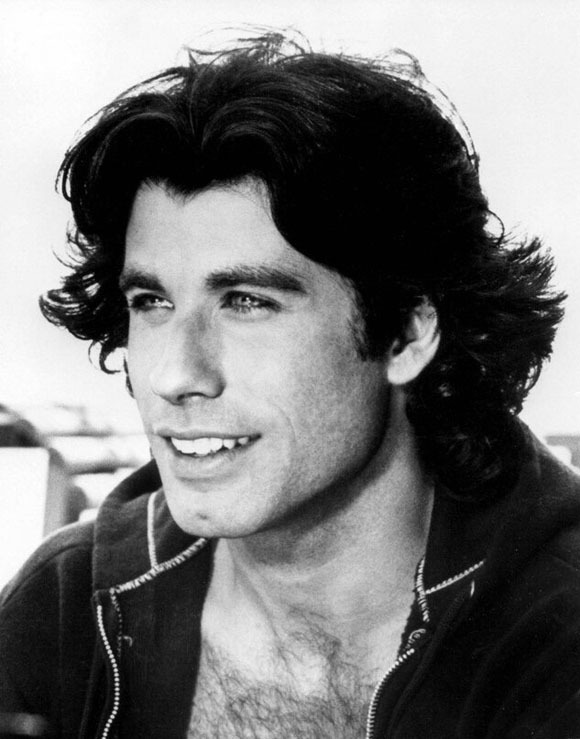 John Travolta in the 1970’s. Playing 19-year-old Tony Manero in Saturday Night Fever about a teen with a good job at the local hardware store in Brooklyn who is trying to dance his way to a better life. His performance earned the 23-year-old Travolta an Academy Award nomination for Best Actor in a Leading Role that year. Donna Pescow as Annette and John Travolta as Tony. In Saturday Night Fever, Annette is Tony’s former dance partner and would-be girlfriend. 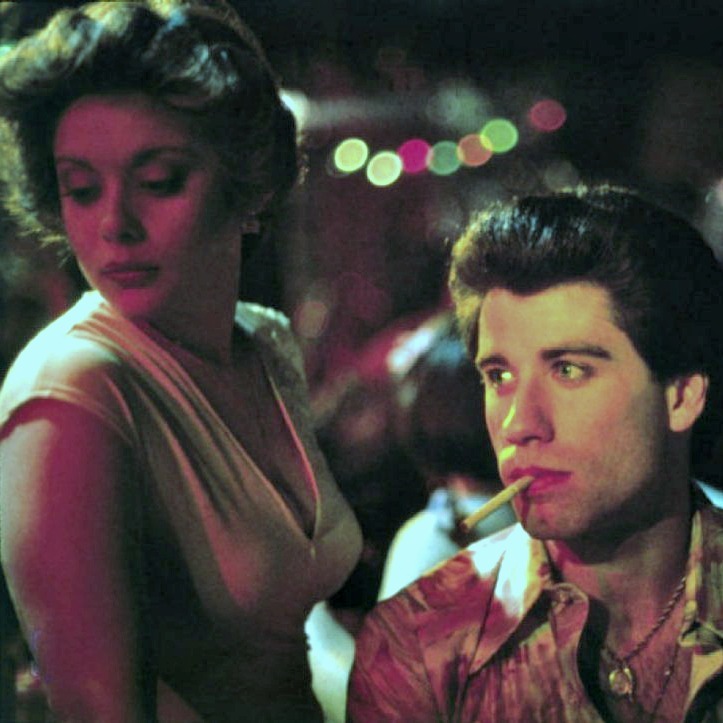 Like Brooklyn-born Donna Pescow and others in the cast of Saturday Night Fever, co-star Karen Lynn Gorney, John Travolta’s love interest in the film, was a newcomer. Even Travolta who had a swelling fan base because of his ongoing role as Vinnie Barbarino in the popular late 1970’s TV sitcom Welcome Back, Kotter, was not seen as a dance man. 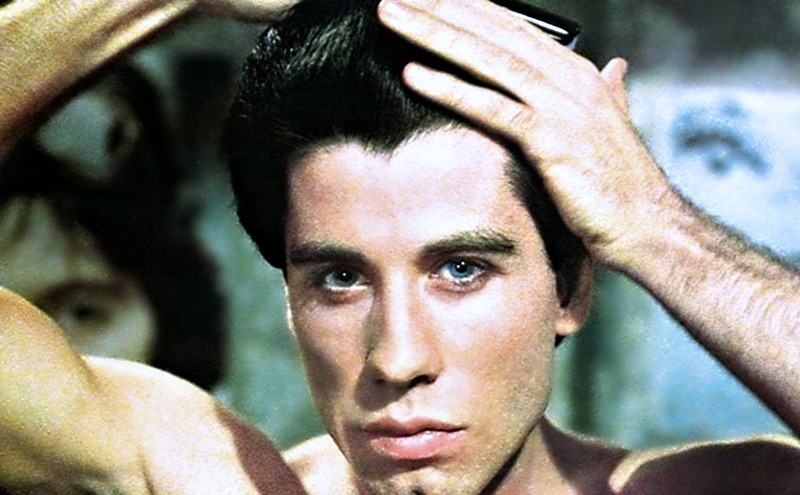 Hungry to take his acting career to the next level, Travolta’s energetic dance scenes had critics praising his performance as among the best ever filmed. 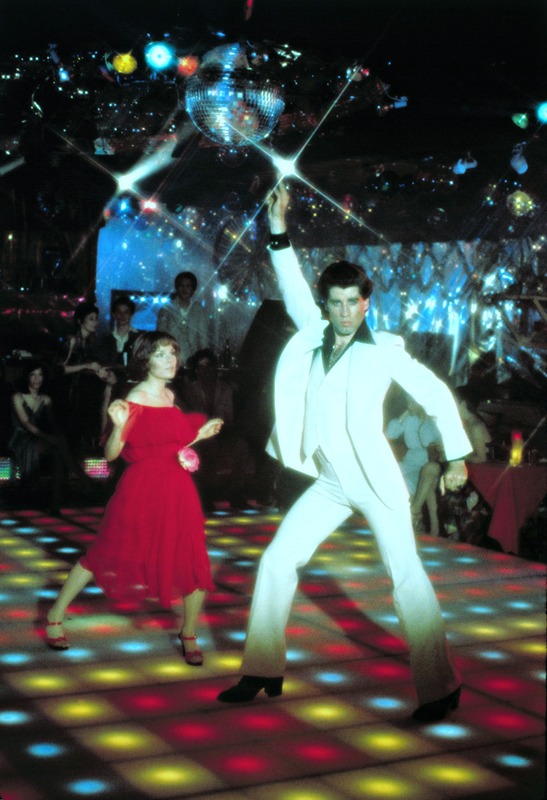 This two-minute scene of disco dancing by John Travolta thrust his energetic performance into the annals of film history. “Robert Stigwood explained to the Bee Gees about this young guy, who every weekend blows his wages at a disco in Brooklyn. He’s got a really truly Catholic family, and he’s got a good job, but he blows his wages every Saturday night. He has his mates with him. Then he comes back and starts the week again, and this goes on every Saturday night. But it’s just this one Saturday night that’s filmed. So that’s what we knew (about a film we were writing music for) except it was John Travolta playing the part…” Maurice Gibb in Bee Gees: The Authorized Biography. 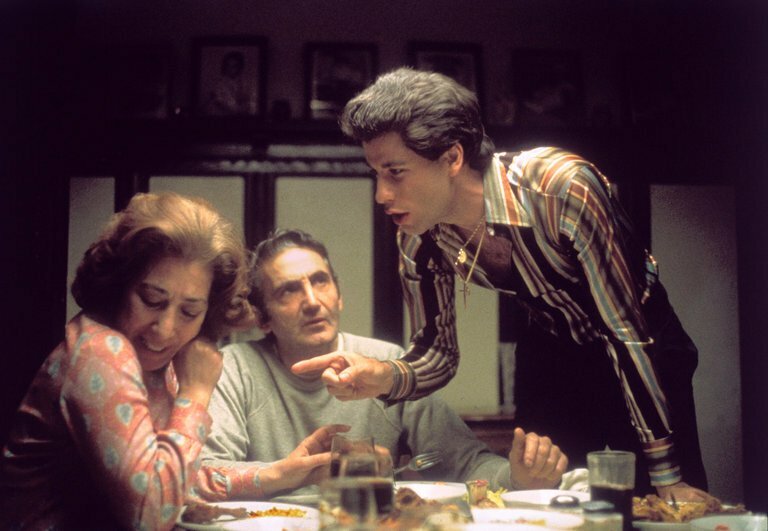 Tony Manero’s mother and father (Flo Bovasso and Val Bisoglio) had other priorities than Tony’s future. Tony’s friends Bobby C. (Barry Miller), Double J. (Paul Pape), and Joey (Joseph Cali). The Bee Gees in 1977. Robin, Maurice, and Barry Gibb in 1978. Barry said that year: “When we were kids, we’d sit on each other’s beds all night and plan our careers. We decided that when we got to the top, we’d have our own office. We wanted to get to a point where we wouldn’t have to ever work again so we could sit back and enjoy everything we had accomplished. A few years ago that seemed forever out of reach. Sometimes I think I’m living that dream now. We’ve never really made it before. If this is indeed the top, then it’s better than what we imagined. It’s a lot of fun.” Bee Gees: The Authorized Biography. 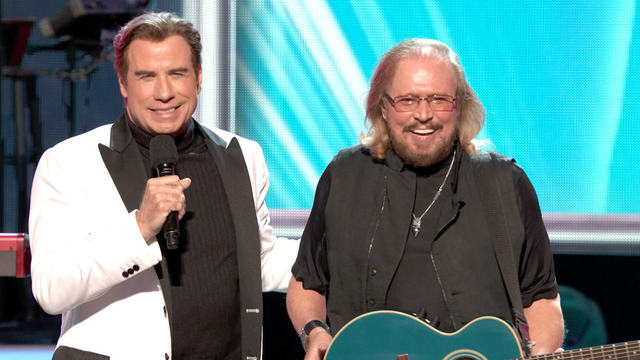 70-year-old Barry Gibb was honored during Stayin’ Alive: A Grammy Salute to the Music of the Bee Gees in April 2017 where he got up on stage to close out the show to perform a few hit songs. 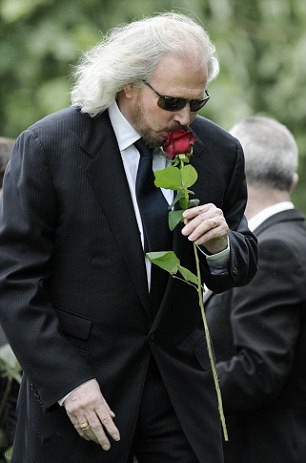 Barry at his brother Robin’s funeral in England in June 2012. During one visit to the hospital while Robin was in a coma, Barry sang a song that he had written for him called The End Of The Rainbow. 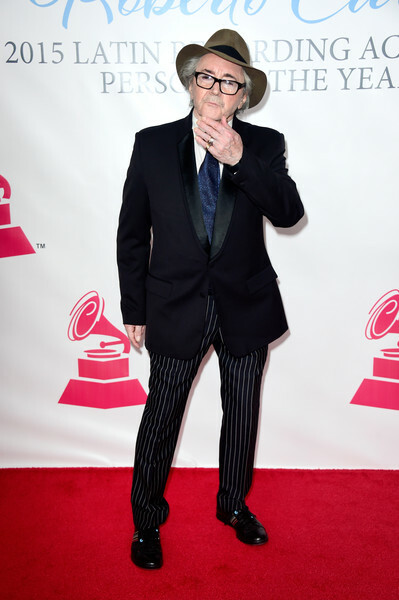 Rolling Stones List – https://www.rollingstone.com/music/lists/the-500-greatest-songs-of-all-time-20110407 – Retrieved January 19, 2018. 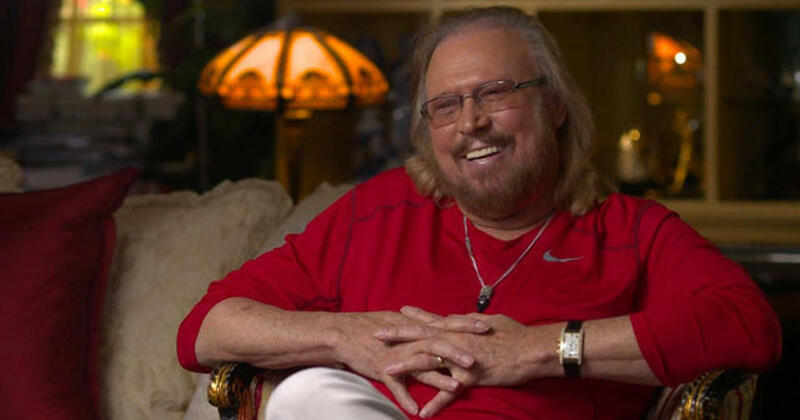 Barry Gibb’s favorite song – The Bee Gees: 35 Years of Music, Billboard: 27. March 24, 2001. – Retrieved September 13, 2017. TV poll – https://web.archive.org/web/20121019120053/http://www.itv.com/beegees/ – Retrieved September 13, 2017. Song’s recording and release dates – Bee Gees Anthology (songbook) by the Bee Gees, Hal Leonard (1991) and Bee Gees The Authorized Biography, Barry, Robin and Maurice Gibb (as told to David Leaf), Delilah Communications/A Delta special, 1979, p.116. Didn’t want to compose music for a film – The Ultimate Biography Of The Bee Gees: Tales Of The Brothers Gibb, By Melinda Bilyeu, Hector Cook, Andrew Môn Hughes, 2001, Omnibus Press, London, pp. 411; Hardly told the film plot – Bee Gees The Authorized Biography, Barry, Robin and Maurice Gibb (as told to David Leaf), Delilah Communications/A Delta special, 1979, p.110. Surprised music with unseen film meshed – Bee Gees The Authorized Biography, Barry, Robin and Maurice Gibb (as told to David Leaf), Delilah Communications/A Delta special, 1979, p.111; Ebert on Siskel’s favorite film – https://www.rogerebert.com/reviews/great-movie-saturday-night-fever-1977 – Retrieved January 24, 2018; other critics’ praise of film- see Pauline Kael, “Nirvana,” The New Yorker, December 26, 1977, pp. 59-60; film low budget, released late- The Ultimate Biography Of The Bee Gees: Tales Of The Brothers Gibb, By Melinda Bilyeu, Hector Cook, Andrew Môn Hughes, 2001, Omnibus Press, London, pp. 411. Regarding the white suit that had been bought off the rack in Brooklyn for the film, its symbolism in Saturday Night Fever has been postulated. Professor Deborah Nadoolman Landis, a designer and historian of film costume stated that the white suit was a symbol of aspiration and hope in an otherwise “dark little movie” – see https://www.theguardian.com/artanddesign/2012/aug/06/john-travolta-white-suit-v-and-a – retrieved January 25, 2018. Song’s musical concept – The Ultimate Biography Of The Bee Gees: Tales Of The Brothers Gibb, By Melinda Bilyeu, Hector Cook, Andrew Môn Hughes, 2001, Omnibus Press, London, pp. 411-412. First song composed for Saturday Night Fever, Château d’Hérouville – Bee Gees The Authorized Biography, Barry, Robin and Maurice Gibb (as told to David Leaf), Delilah Communications/A Delta special, 1979, p.109. Songs written quickly – Ibid., p.109; lyrics later – The Ultimate Biography Of The Bee Gees: Tales Of The Brothers Gibb, By Melinda Bilyeu, Hector Cook, Andrew Môn Hughes, 2001, Omnibus Press, London, p. 415. Open to suggestions – Bee Gees The Authorized Biography, Barry, Robin and Maurice Gibb (as told to David Leaf), Delilah Communications/A Delta special, 1979, p.107. emotional piano chords – The Ultimate Biography Of The Bee Gees: Tales Of The Brothers Gibb, By Melinda Bilyeu, Hector Cook, Andrew Môn Hughes, 2001, Omnibus Press, London, p. 411-12.
song composing, arrangement, and production – The Ultimate Biography Of The Bee Gees: Tales Of The Brothers Gibb, By Melinda Bilyeu, Hector Cook, Andrew Môn Hughes, 2001, Omnibus Press, London, pp. 409 and 412. Title chose Ibid. p. 412. 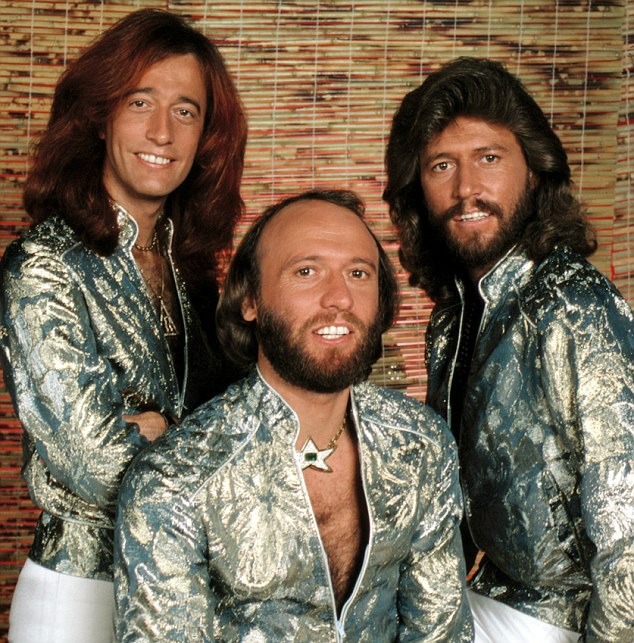 Movie’s ultimate success – Bee Gees The Authorized Biography, Barry, Robin and Maurice Gibb (as told to David Leaf), Delilah Communications/A Delta special, 1979, p.112. Costing $3.5 million to make, Saturday Night Fever earned an impressive $237.1 million –see “Saturday Night Fever, Box Office Information”. Box Office Mojo – retrieved May 26, 2014. Soundtrack album certified God and Platinum -http://www.beegees-world.com/bio_gplat.html -Retrieved February 1 , 2018. certified 16x Multi-Platinum on November 16, 2017 – see https://www.riaa.com/gold-platinum/- retrieved January 24, 2018. Number one hit internationally – “Songs Written by the Gibb Family on the International Charts – Part 3”(PDF). 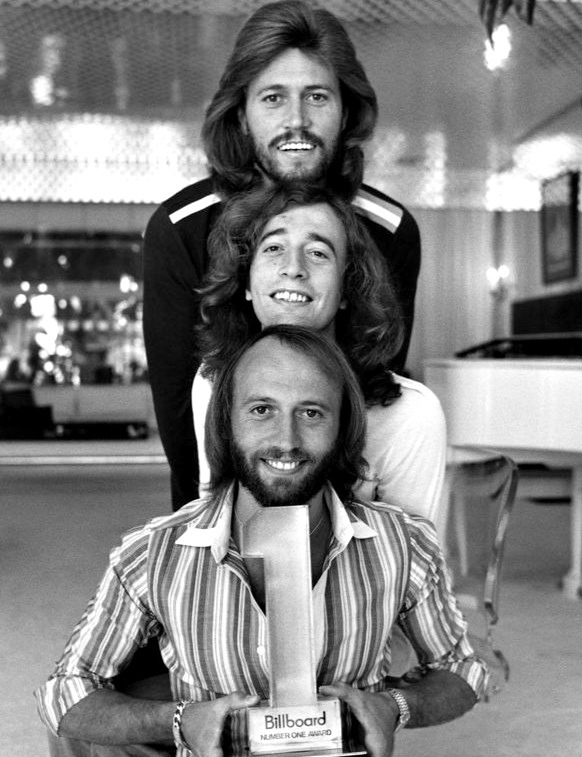 http://www.brothersgibb.org/download/page-3.pdf – Retrieved January 24, 2018; number 3 in Britain – The Ultimate Biography of the Bee Gees: Tales of the Brothers Gibb, By Melinda Bilyeu, Hector Cook, Andrew Môn Hughes, 2001, Omnibus Press, London, p. 421. Continued with their readiness to work – The Ultimate Biography of the Bee Gees: Tales of the Brothers Gibb, By Melinda Bilyeu, Hector Cook, Andrew Môn Hughes, 2001, Omnibus Press, London, pp. 467.©John P. Walsh. All rights reserved. No part of this material may be reproduced or transmitted in any form or by any means, electronic or mechanical, which includes but is not limited to facsimile transmission, photocopying, recording, rekeying, or using any information storage or retrieval system. This entry was posted in Film & Media, Music and tagged Bee Gees, How Deep is Your Love, John Travolta, Robert Stigwood, Saturday Night Fever, Saturday Night Fever: The Original Movie Sound Track on February 1, 2018 by jwalsh2013. 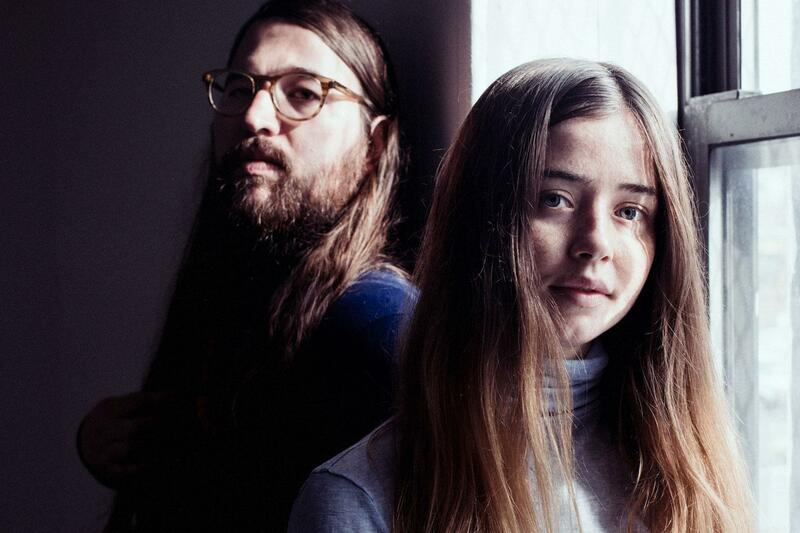 Anglo-American musical duo: Flo Morrissey and Matthew E. White. English singer and songwriter Flo Morrissey (b. 1994) and Richmond, Virginia-based producer and musician Matthew E. White (b. 1982) teamed up for a collaborative full duet album of ten cover songs called Gentlewoman, Ruby Man. It was released in January 2017 by Glassnote Records. Following months of preparation, the cover songs were selected from a wide range of musical artists and recorded in 10 days at White’s Spacebomb Studios in downtown Richmond. The album’s first track is their cover version of Little Wings’ Look At What The Light Did Now (3:21 minutes). Little Wings is a band founded in the late 1990’s in San Luis Obispo, California, by Alabama-born indie rocker Kyle Field (b. 1972). The original Little Wings version of the song is a vocal duet with acoustic guitar released in 2002. Meeting at a music event in London in October 2015—Matthew White had first learned about Flo Morrissey from an article about her on The Guardian website— the busy English and American artist each signed to two different record labels found out they worked well together. 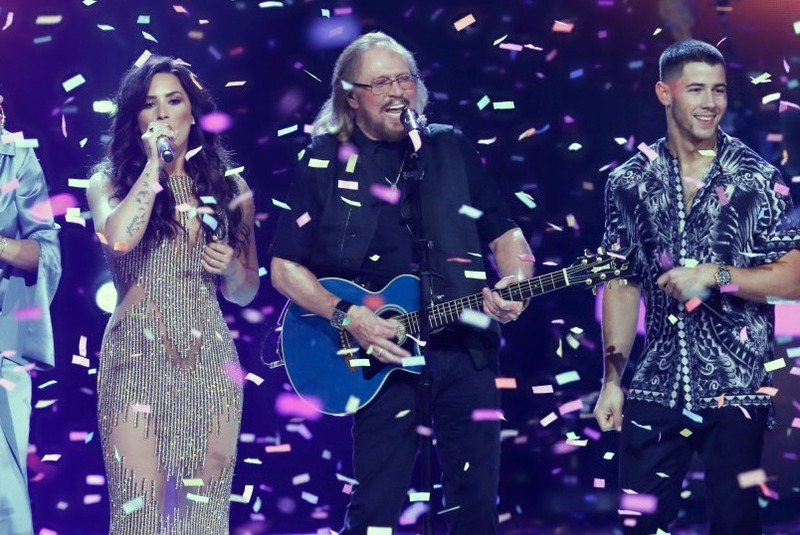 Both of them liked recording cover versions of great but also personally resonating songs as it allowed them to reach a new generation of listeners as well as to focus on their vocal performances and the songs’ production values. After the duo compiled a list on Spotify of around 500 songs they chose their own list of ten songs based not so much on what they went into the project expecting to do but newer material and even R&B resulting in a diverse group of musical artists, such as Leonard Cohen, Frank Ocean, the Bee Gees, and James Blake. This entry was posted in Music and tagged Flo Morrissey, Little Wings, Matthew E. White, Spacebomb Studios on December 19, 2017 by jwalsh2013. Irish Folk Song: Bríd Óg Ní Mháille (Young Bridget O’Malley). Featured Image is La Ghirlandata. 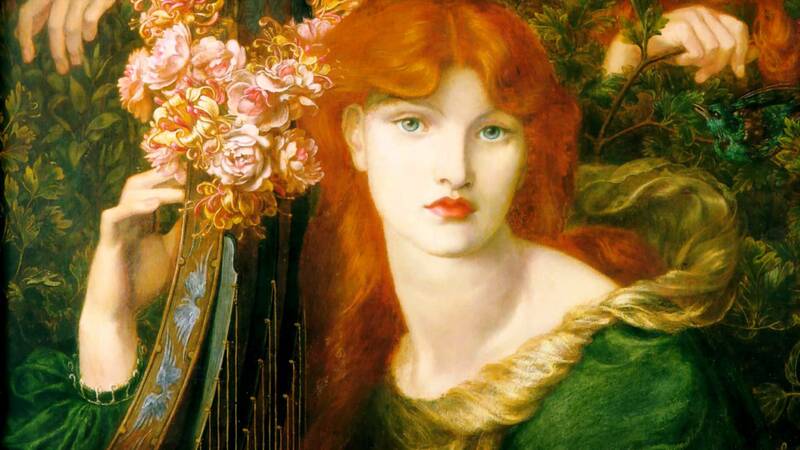 Dante Gabriel Rossetti (1828-1882). 1873. Oil on canvas. 124 x 85 cm. Guildhall Gallery, London. City of London Corporation. Bríd Óg Ní Mháille is an Irish Gaelic folk song about a young man who lost his love, “the beauty of Oriel,” to another suitor. 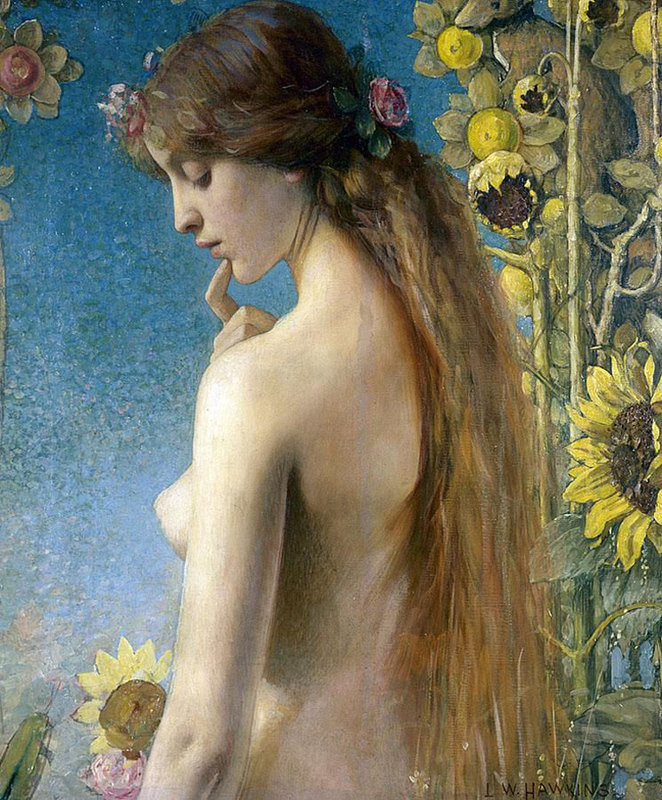 This painting is Clytie by French (born English) Symbolist painter Louise Welden Hawkins (1849-1910). Clytie is a Greek mythological figure whose love was unrequited by Helios, the Sun god. 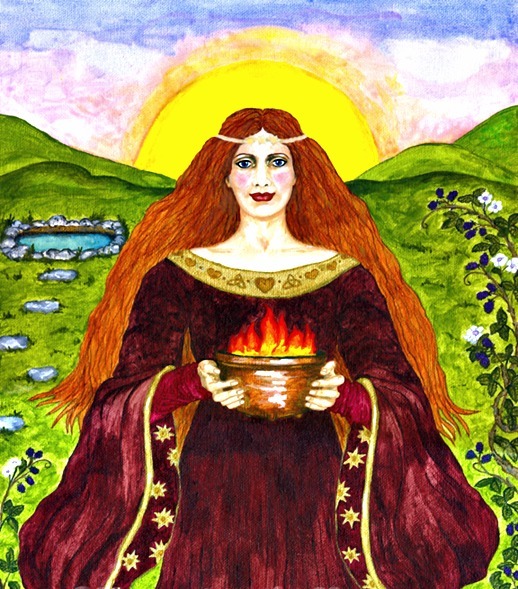 All variations of the name Brigid have the Irish word brígh, which means “fire,” as its root word. In Ireland a generation ago the girl’s first name of Brigid (along with Mary) was one of the island’s most popular. Growing up in Chicago in the 1960s and 1970s, it seemed that a lot of Irish-American girls were named Brigid, or wished to be. 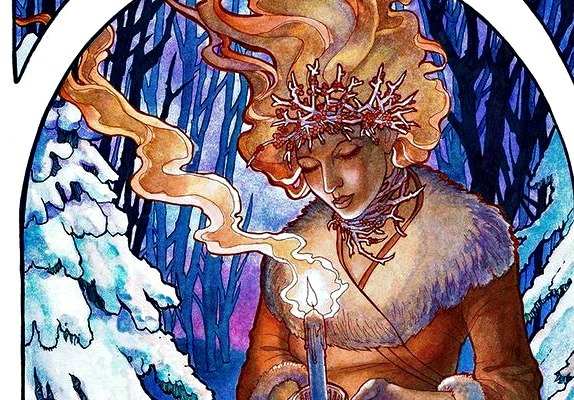 By the 2010s the name of Brigid was no longer, in Ireland at least, very popular as other girls’ names replaced it.1 In Ireland the name Brigid is rendered in a healthy variety of ways. The well-known Bridget is the English variant. In this Irish folk song Bríd Óg Ní Mháille (Young Brigid O’Malley), it is the Irish language Brid (pronounced Breed). Irish also offers Bride, Brídín, Brighid, Brighidín, Brigit, Breeda, and others. With so many alternatives for a very ancient name it may be surprising that none of them rank high on the popularity charts although their accumulated usage may do so.2 With its root word being breo (which means fire), all variations of Brigid have the Irish word brígh in common. According to the Royal Irish Academy’s Dictionary of the Irish Language, brígh has multiple definitions and meanings. 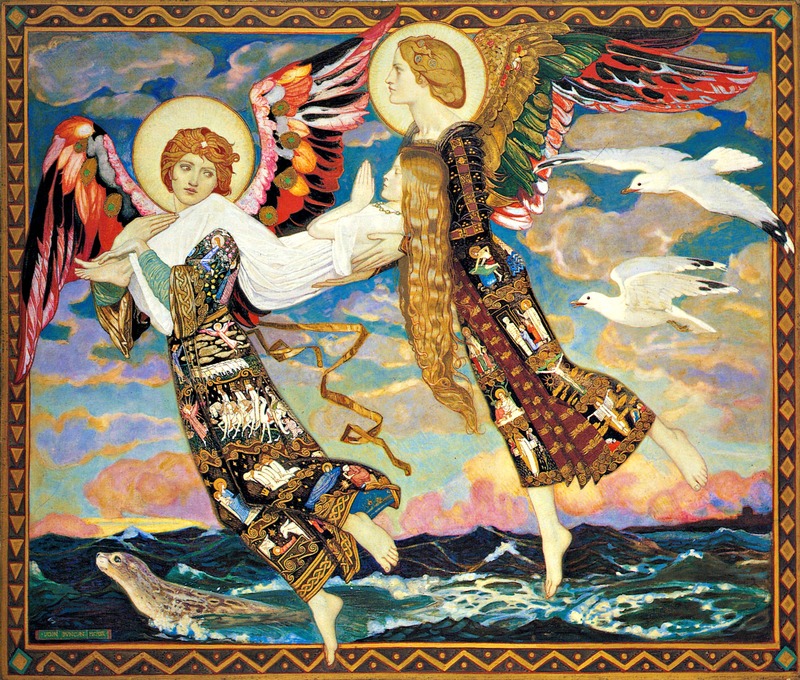 It primarily connotes “power, strength, force, and authority” but also translates as “vigor, virtue and fortitude.” In medicine, brígh refers to the antidote which proves to be strongly effective.3 As Brid is sometimes translated as “strong-willed” and “high born,” it becomes clear that this girl’s appellation possesses excellent qualities that, along with the beauty of its sound when spoken and its venerable ancient history, may presume to reach into the top 100 Irish names for girls some time in the future. Saint Brigid of Ireland (c. 451 – 525) with St. Patrick and St. Columba is one of today’s three patron saints of Ireland. From the moment of her birth in the mid-fifth century her story is shrouded in Christian legends and tales. 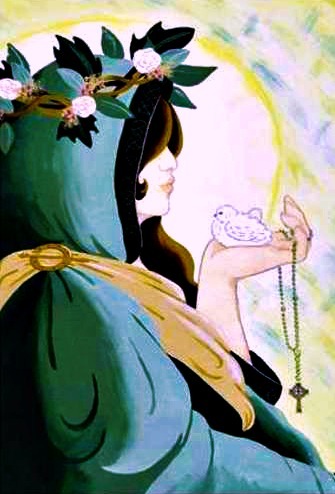 St. Brid is a direct descendant of the older pagan Celtic goddess of the same name. St. Brid’s fire – a flame kept constantly alight in her honor by nuns in the monastery she founded – burned for 1000 years until her monastery along with most others was closed during the Protestant Reformation in the mid-sixteenth century. Brigit is a powerful religious form in Irish history, as she is one of the most complex and contradictory goddesses of the Celts. The pagan goddess is patroness to healers, poets, metal workers – all the practical and inspired civilized arts. 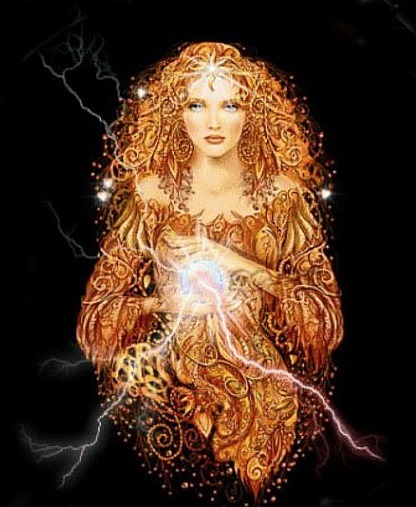 Associated with fire and light she is also guardian of inner vital energy. Bríd Óg Ní Mháille is an Irish folk song in a long line of Irish musical taste about forsaken love. It is performed here brilliantly in the Irish by singer Gillian Fenton who is accompanied on traditional Irish harp by Fiachra O’ Corragáin. There are many traditional and contemporary renditions, however, of this popular late nineteenth-century Irish Gaelic song. Its surge of popularity is an entirely local Irish story. There was a certain young man in mid-20th-century County Mayo who was a Gaelic teacher. He took particular fancy to this tune about a young Irishman who lost his love – the titular Bridget O’Malley – to another suitor and was left “heartbroken…the arrows of death…piercing my heart.”7 The Gaelic teacher, armed with this air about “the beauty of Oriel without any doubt…now married to another…” took it with him back to the county just next door, his native Donegal, where its popularity first flourished. 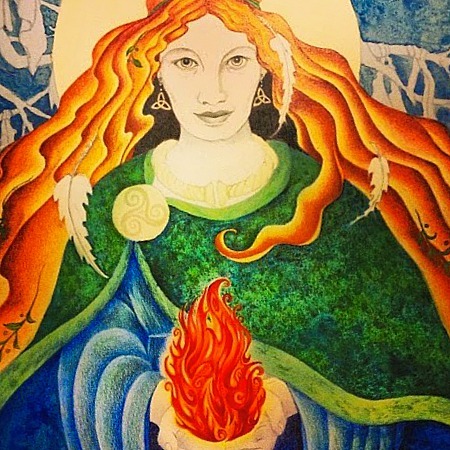 St. Brighid of Ireland is shrouded in ancient legends and myths. 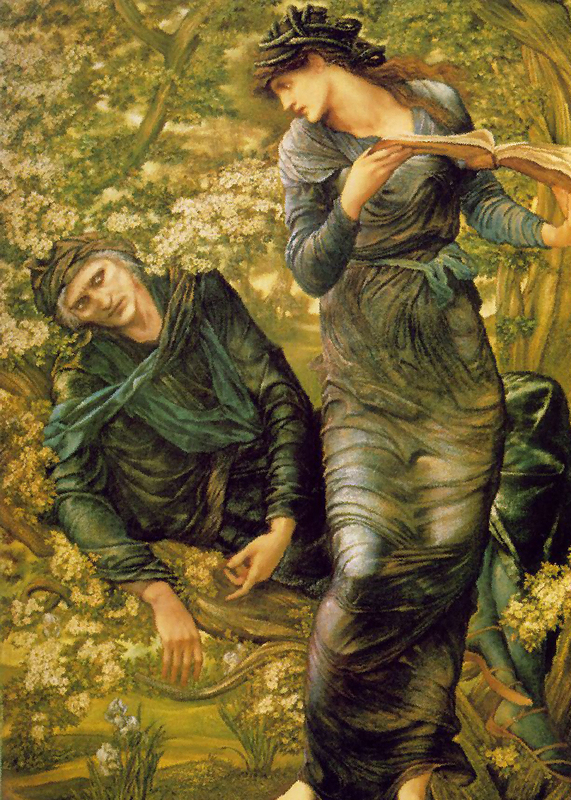 The Beguiling of Merlin, Edward Burne-Jones, 1872–77, Oil on canvas, 186 cm × 111 cm (73 in × 44 in), Lady Lever Art Gallery, Port Sunlight, Merseyside. There is a 12th century story in which Merlin is beguiled by a female figure whose vision thereof inspires or causes History. This female form is sometimes associated with Brigantia. In some stories she is the one who nurtures development of human potential. St. Bride by John Duncan, 1913. Bride is one of the many variations for the English Bridget or Irish Brighid. Others include Brid, Brídín, Brighidín, Brigit, and Breeda. La Ghirlandata. Dante Gabriel Rossetti (1828-1882). 1873. Oil on canvas. 124 x 85 cm. Guildhall Gallery, London. City of London Corporation. In 2015, within the family of girl names directly related to Brígh, Brianna was the most widely used. Brian is the male form of the name. http://edil.qub.ac.uk/6813 retrieved March 29, 2017. See Irish Saints, Robert T. Reilly, Avenel Books, New York, 1981, pp. 16-26. Carey, John. “Tuath Dé” inThe Celts: History, Life, and Culture, edited by John T. Koch. ABC-CLIO, 2012. pp.751-753. See The Oxford Introduction to Proto-Indo-European and the Proto-Indo-European World, J.P. Mallory; D.Q. Adams, 2006, Oxford, England: Oxford University Press. Folksongs of Britain and Ireland, edited by Peter Kennedy, Schirmer Books, New York, 1975, p. 82. 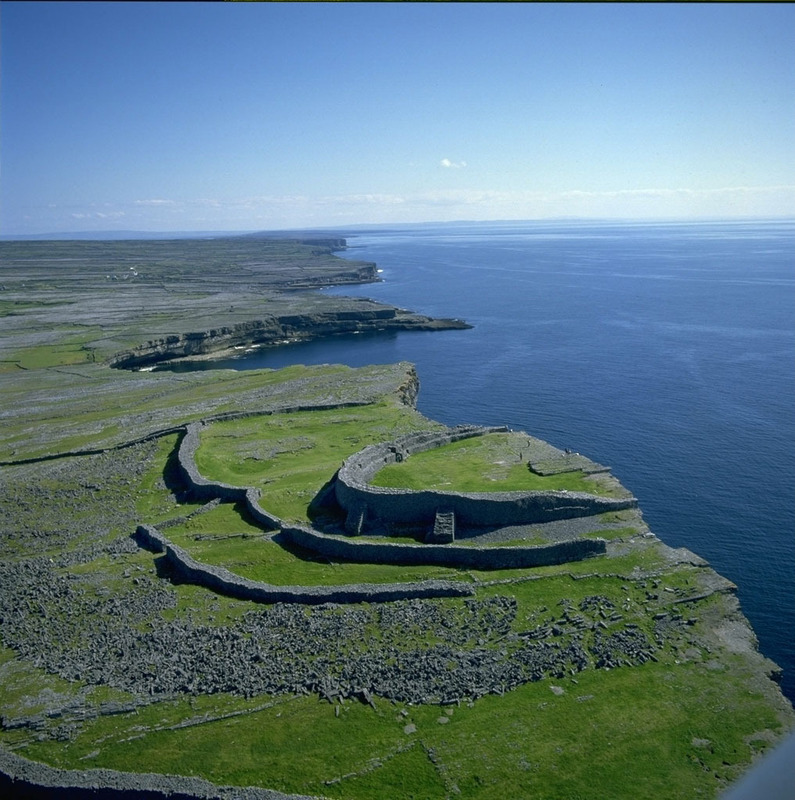 Dun Aengus, Aran Islands (Inishmore), Ireland. Prehistoric fort at the edge of a 100-meter (328 foot) cliff. Constructed around 1100 BC with its triple wall added about 500 BC. This entry was posted in Art, Ireland, Irish Folk Song, Music and tagged Bríd Óg Ní Mháille, Celtic goddess Brigid;, Cooley Mountains, Dante Gabriel Rossetti, Dundalk, Edward Burne-Jones, Fair Bridget (Brid Bhan), Fiachra O' Corragáin, Gillian Fenton, Guildhall Gallery London, Irish Folk songs, Lady Lever Art Gallery, St. Brigid of Ireland, St. Columba, St. Patrick, Young Bridget O'Malley on March 29, 2017 by jwalsh2013. 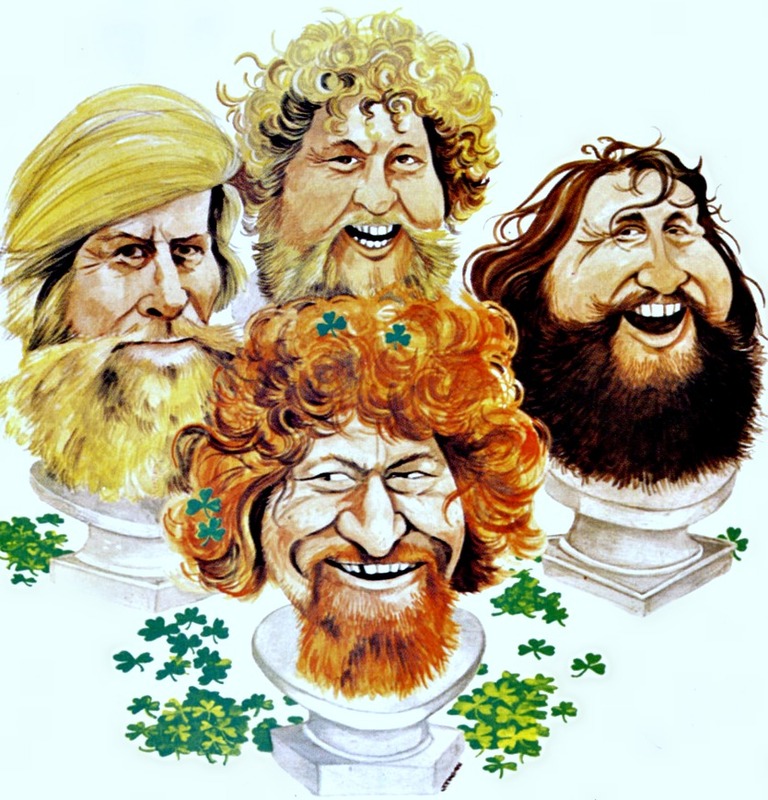 Irish Folk Song: “Weile Weile Waila” as performed by The Dubliners. The Dubliners, ca. 1970 (left to right. 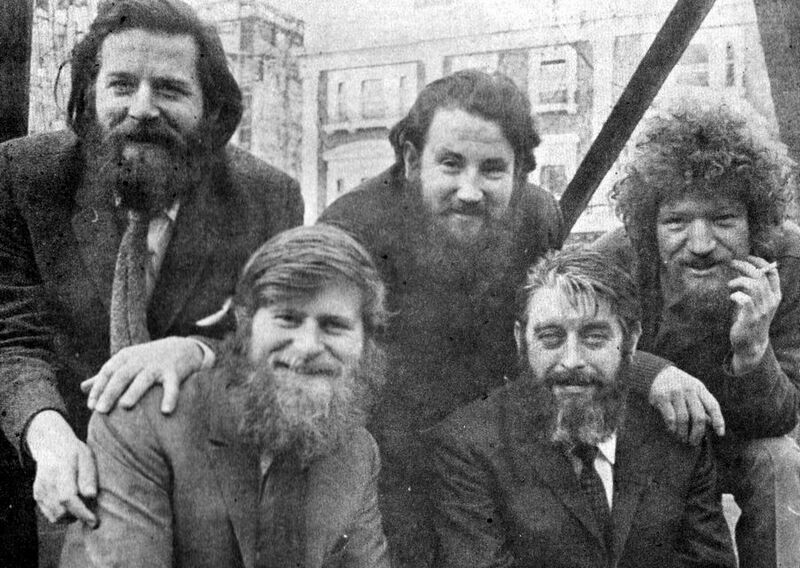 top: Ciarán Bourke, Barney Mckenna, Luke Kelly; front: John Sheahan, Ronnie Drew). 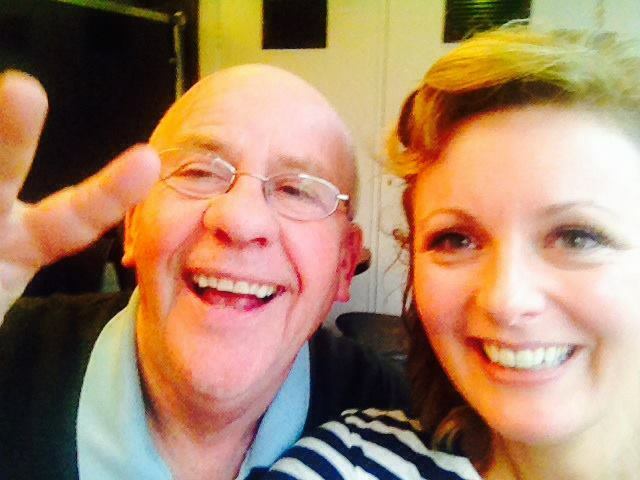 Craicing Selfie with Seán Bán Breathnach. 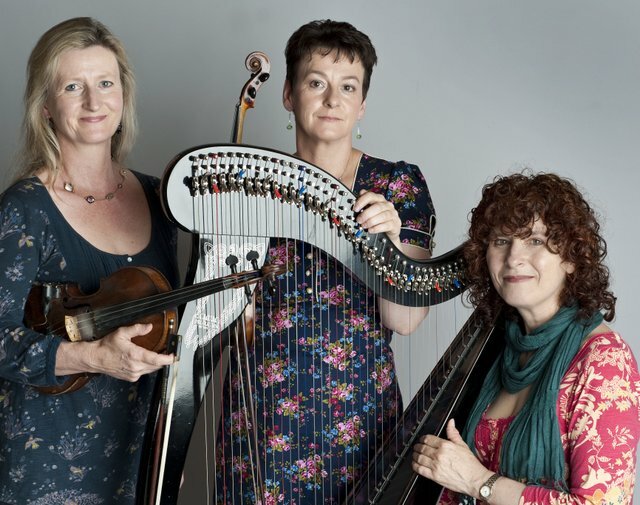 The Casey Sisters (Nollaig Casey, Mairéad Ní Chathasaigh, and Irish harper Mairé Ní Chathasaigh). With UK acoustic guitarist Chris Newman, Mairé Ní Chathasaigh has performed in over 20 countries on 5 continents. 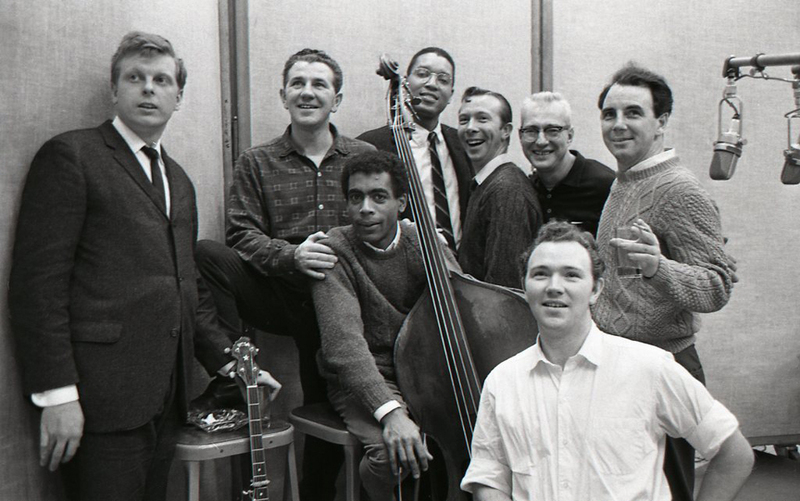 The Clancy Brothers and Tommy Makem with bassist Bill Lee, ca. 1964. Photo: Don Hunstein. 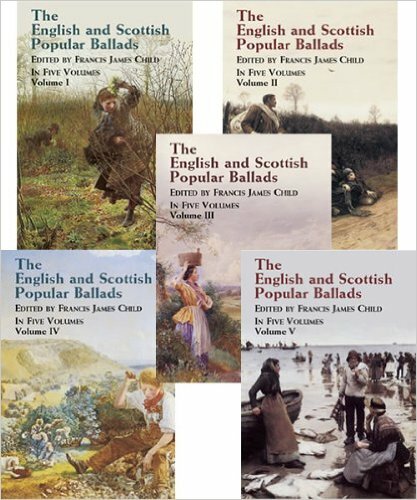 The English and Scottish Popular Ballads, 1882–1898 of Francis James Child. An undated engraving of Child, by Gustav Kruell (German, 1843-1907). Note the rose at the upper right. The song’s title phrase Weile Weile Waila is itself murky. 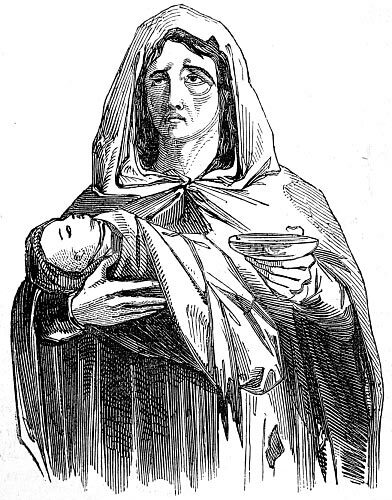 Likely medieval in origin, the term’s original meaning is lost to history although in Ireland in the nineteenth century it was primarily used for a popular exclamation of grief – an emotion much roused and justified on the island in that time period.7 This Irish version of Francis James Child’s “The Cruel Mother” poses its own specific plot. An “old” (no longer “cruel”) woman who “lived in the woods” stabs an infant “three months old” to death along the banks of the River Saile, a stream which may refer to one that flows today in and near Dublin. The River Saile that features in the Irish folk song Weile Weile Waila may be a local name given to the River Poddle in the city of Dublin. 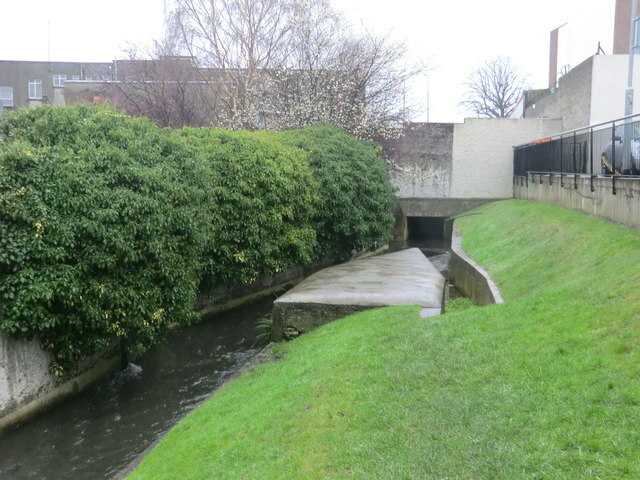 The River Poddle is a tributary of the Liffey, rising in Cookstown to the north of Tallaght. From its source, it flows into Dublin City, and splits at Mount Argus at what is known as the “Tongue” or “stone boat” pictured above. 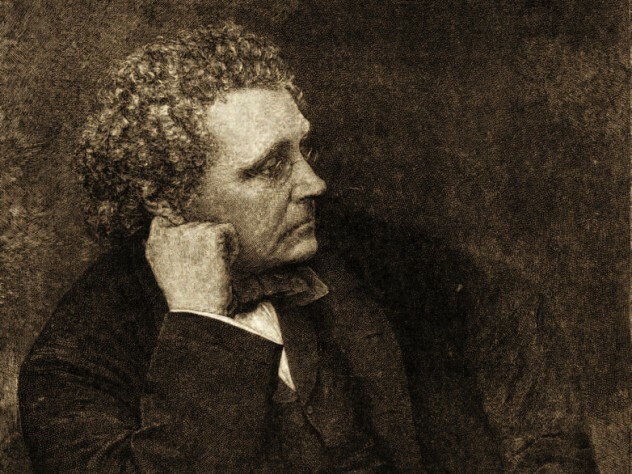 In the Irish version, the old woman is probably not the mother of the baby which provides a remarkable variant to a historic song that extensively describes a cruel mother. 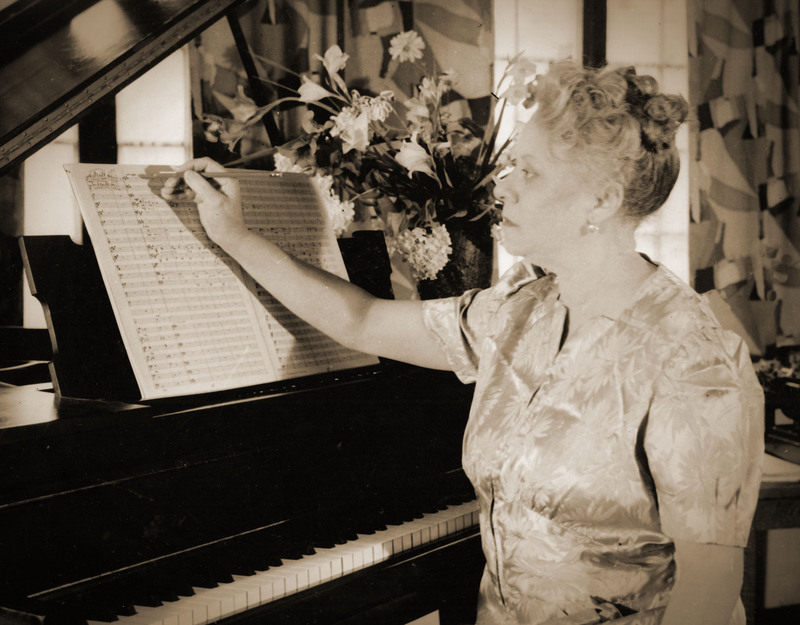 Yet the old folk song’s dark flavor is retained for use as a nursery rhyme obviously sung by a young mother to her child perhaps with humor and loving, benign menace. The old woman uses the song’s prevalent pen-knife (here made “long and sharp”) and is quickly approached and arrested by “two policemen” and “a man” to be “sent to jail” where she is dispatched to the gallows and executed for the crime. This series of events unique to the Irish lyric (some of it updated as recently as the 1970s) is that the cruel mother’s hope for eternal mercy or fear of eternal damnation that ends the many Child Ballad versions is replaced with harsh justice for the old woman in the here and now. The death of the baby also is specifically lamented. 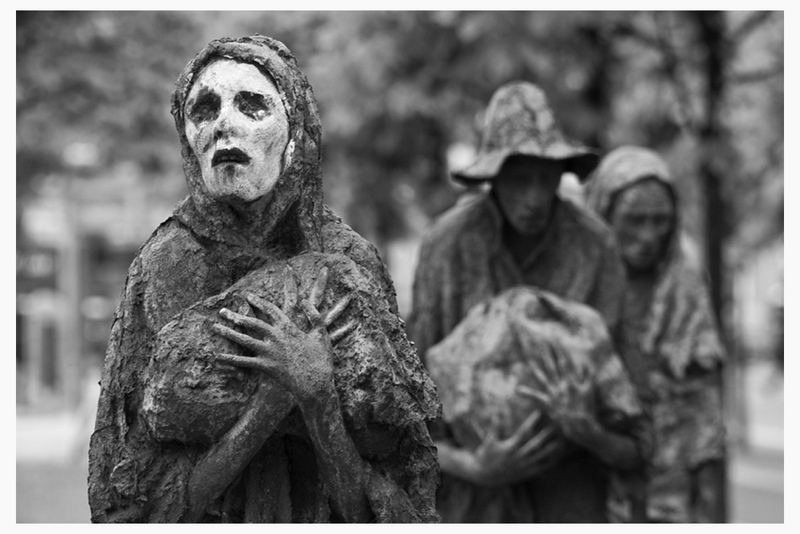 Suffering associated with The Irish Famine of 1845-50 depicted in a contemporary sculpture (1997) called Famine by Rowan Gillespie in Dublin. While causes and numbers are hotly debated, approximately one million people died and at least one million more emigrated from Ireland according to David Ross in Ireland: History of a Nation (2002, Geddes & Grosset, New Lanark). The song retains in each verse that popular Irish exclamation of grief – Weile Weile Waila –injecting into its dark proceedings, now made into a nursery ditty, a forlorn lyric that stands on the precipice to describe with open eyes shocking and oftentimes glossed-over ancillary misfortunes in Ireland during years of mass starvation and disease in the mid-nineteenth century. Its specificity of Irish suffering – the “end” of the old woman and the baby – describes a cycle of viciousness met by harsh earthly justice that makes for a sobering two minutes of Irish folk music. The song’s material carries forward to the present a sharp slice of Ireland’s former meaner times when members of local communities could be driven to despicable acts when necessary resources for survival are long delayed. In this short nursery rhyme with an ample and well-documented folk song history (and popularized in the 1970s by the folk band The Dubliners) Irish parents and children alike could be entertained by others’ calamities where the guilty are meted out justice and the innocent are bemoaned. (“There was an old woman and she lived in the woods…”) Woman begging with baby in Clonakilty (County Cork), Ireland. Portrait print of a destitute mother holding her baby in one arm and a begging bowl in the other. These miserable conditions were brought on by the Great Famine and compounded by socio-economic practices such as forced evictions of poverty-stricken peasants from their homes and farms. Child collection – see http://harvardmagazine.com/2006/05/francis-james-child.html; Folksongs of Britain and Ireland, Peter Kennedy, Schirmer Books, New York, 1975. Quote Seán Bán Breathnach – Fintan Vallely, Companion to Irish Traditional Music, New York University Press, New York, 1999, p. 9. New bands recording Irish folk songs include, in Ireland, The Corrs; in Britain, The Pogues; and in the United States, Dropkick Murphys as well as Flogging Molly. There are many others. There are many sources on the subject of Irish emigration in the mid-nineteenth century. What is noteworthy is that the causes for it and numbers involved in it frequently remain intensely debated. On the subject of Child Ballads – see Mary Ellen Brown, Child’s Unfinished Masterpiece: The English and Scottish Popular Ballads, University of Illinois Press, Urbana, 2011 and E. Housman, British Popular Ballads, Ayer Publishing, 1969. Child’s 17 versions of “The Cruel Mother” – http://www.sacred-texts.com/neu/eng/child/ch020.htm. 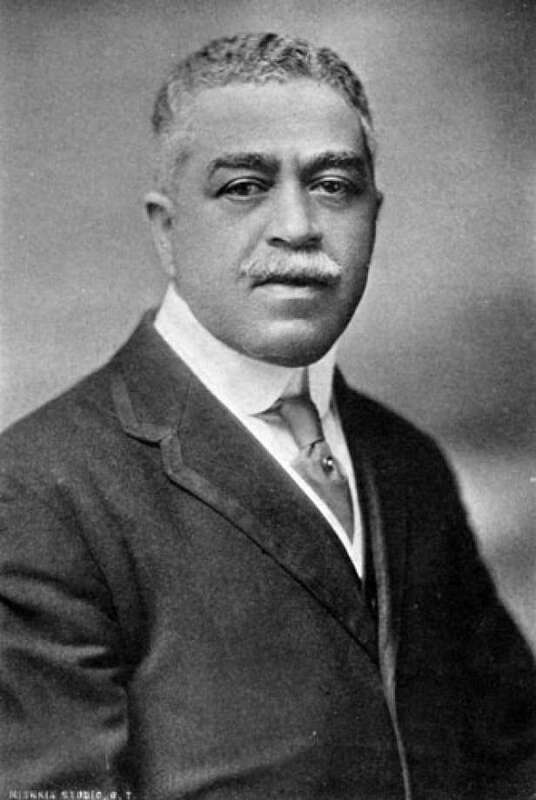 Meaning of term weila weila waila – Robert E. Lewis, Middle English Dictionary, 1999, University of Michigan Press. p. 232. This entry was posted in Ireland, Irish Folk Song, Music and tagged Francis James Child, Irish Folk songs; The Dubliners:, Mairé Ní Chathasaigh, Seán Bán Breathnach, Weile Weile Waila; on January 30, 2017 by jwalsh2013. The year is 1966. 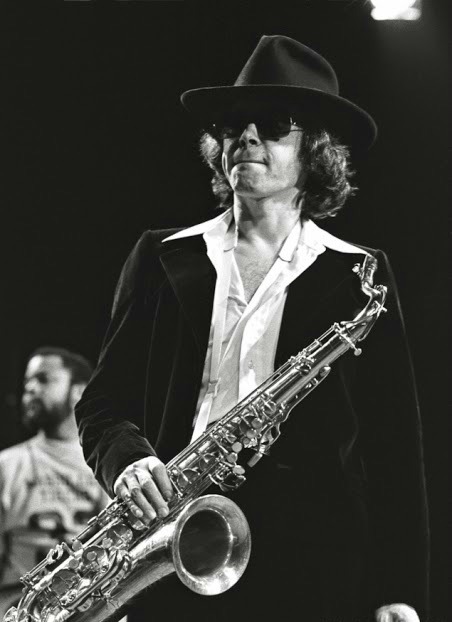 Tenor saxophonist Gato Barbieri is joined by trumpeter Don Cherry, jazz vibraphonist Karl Berger (German, b. 1935) and bassist Bo Stief (Danish, b. 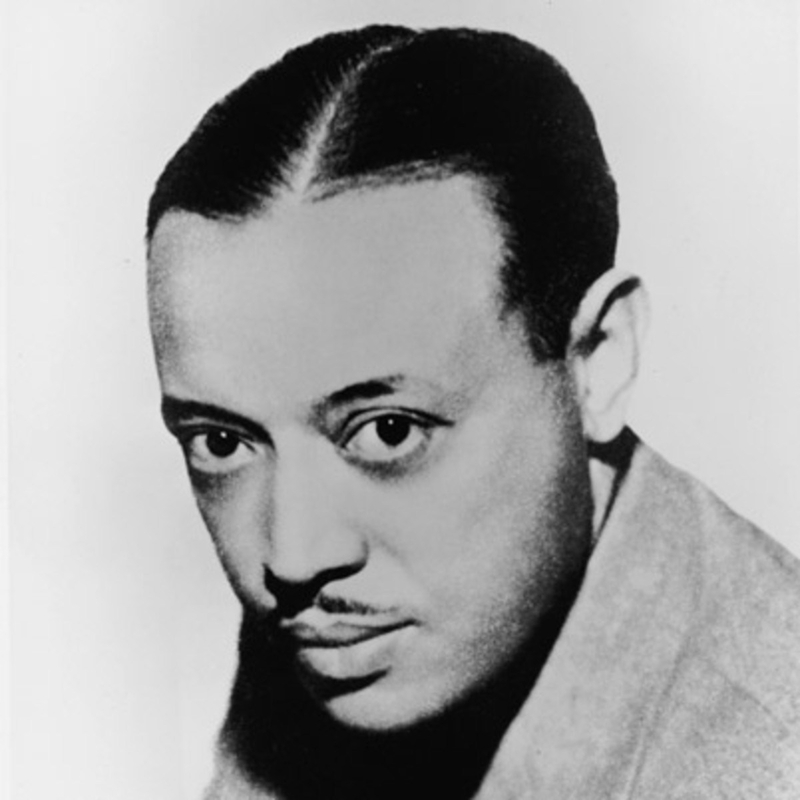 1946). 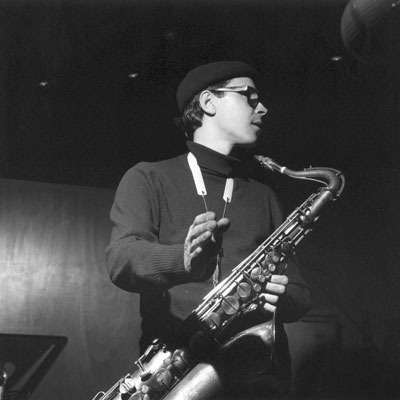 In the mid 1960’s Barbieri and Cherry recorded two albums for Blue Note: Complete Communion and Symphony For Improvisors. 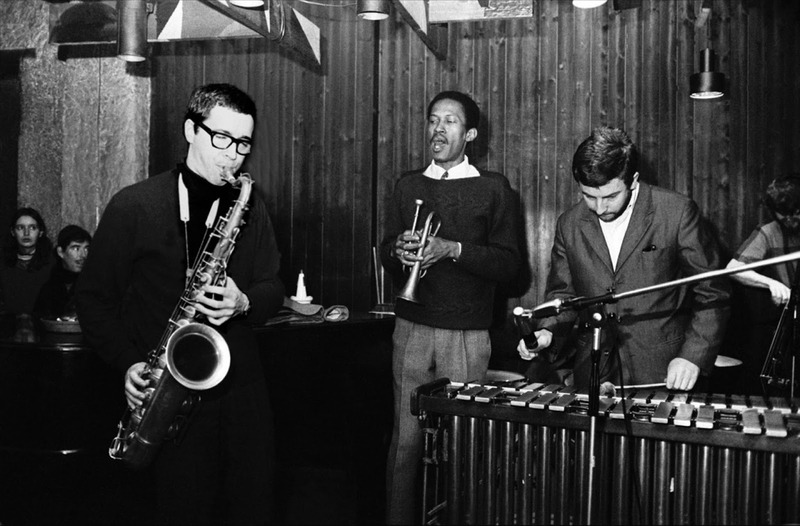 In that era Gato also recorded with jazz saxophonist and composer Steve Lacy (1934-2004) and South African pianist Abdullah Ibrahim (b. 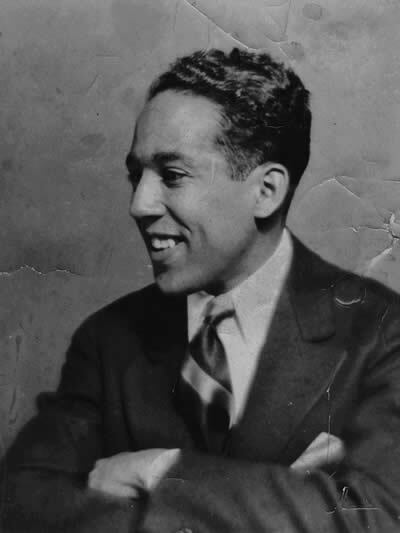 1934). 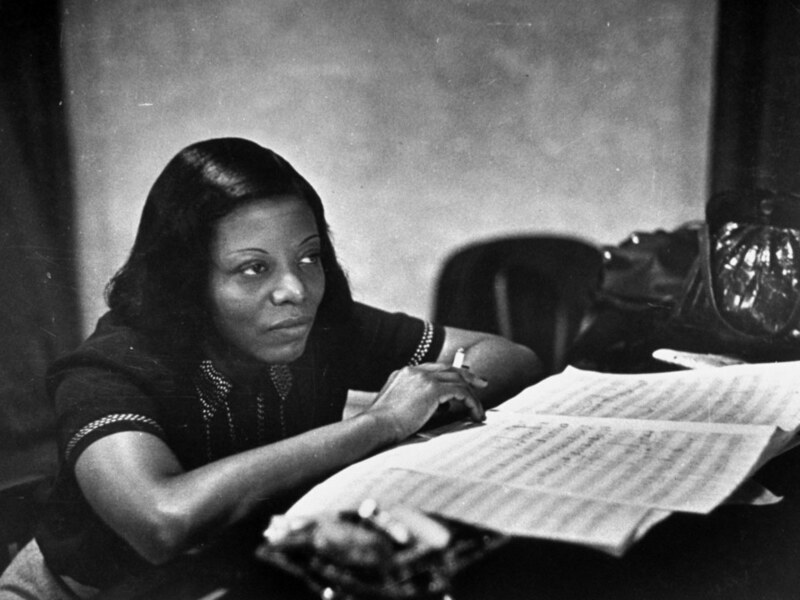 Barbieri’s free jazz meant playing with American jazz double bass player Charlie Haden (1937-2014), American jazz pianist Carla Bley (B. 1936), and many others. The Cat was also found jamming with jazz bassist Stanley Clarke (b. 1951), Brazilian jazz drummer and percussionist Airto Moreira (b. 1941), Cuban composer Chico O’Farrill (1921-2001) and American jazz musician Lonnie Liston Smith (b.1940). 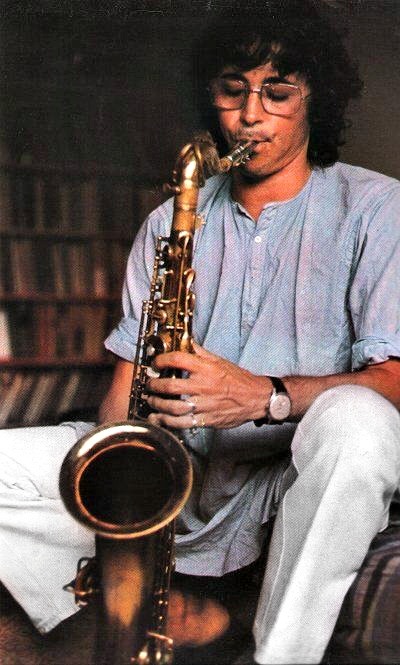 After the death of his wife and closest confidante Michelle from a long illness in 1995, Barbieri returned with one of the top selling contemporary jazz albums in 1997: Que Pasa on Columbia Records. 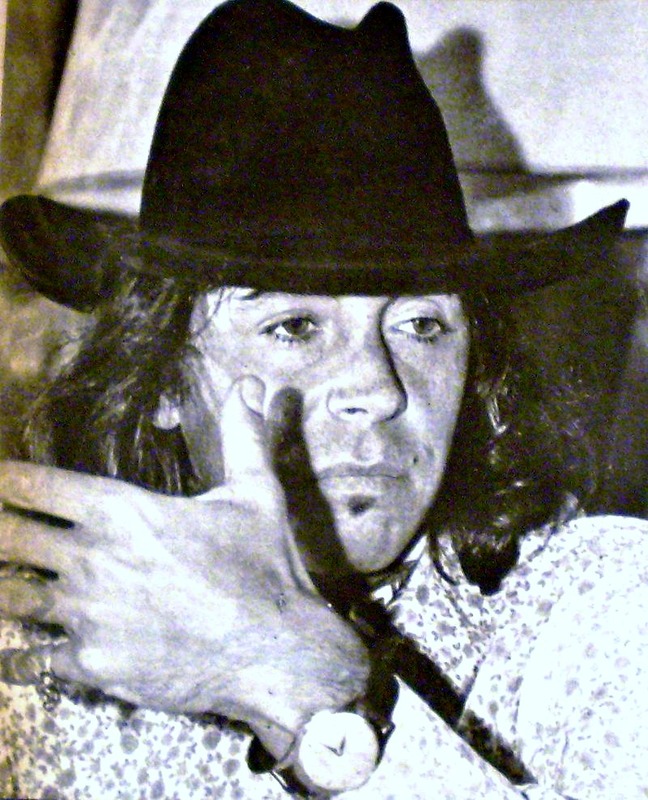 Barbieri recorded a handful of albums on the Flying Dutchman label in the early 1970s and then signed with Impulse where he recorded his classic “Chapter Series” which included Latin America, Hasta Siempre, Viva Emiliano Zapata and Alive in New York. Friends of Chile benefit concert, Madison Square Garden, May 6, 1974. 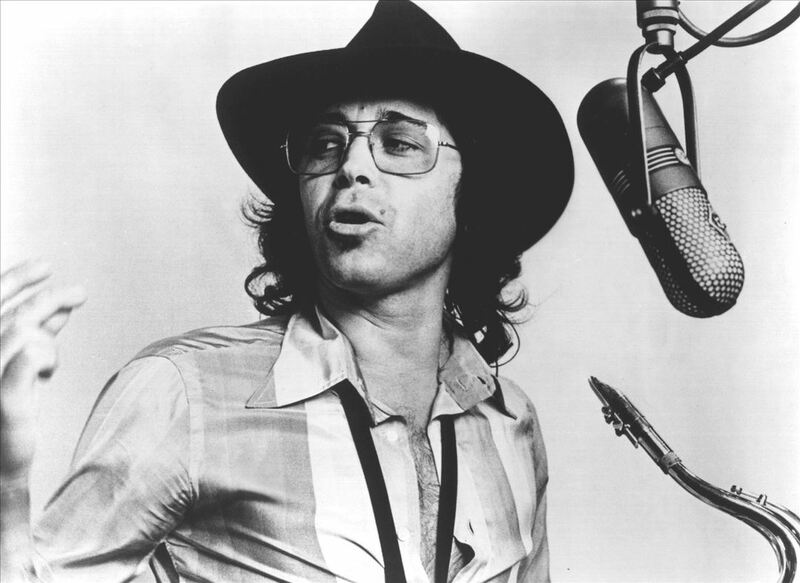 Gato Barbieri’s five albums on A&M Records in the late 1970s featured a more soothing jazz-pop sound. In the 1980s the “cat” kicked it up a notch for Para Los Amigos (1984), an album which spotlighted the rock-influenced South American sound. 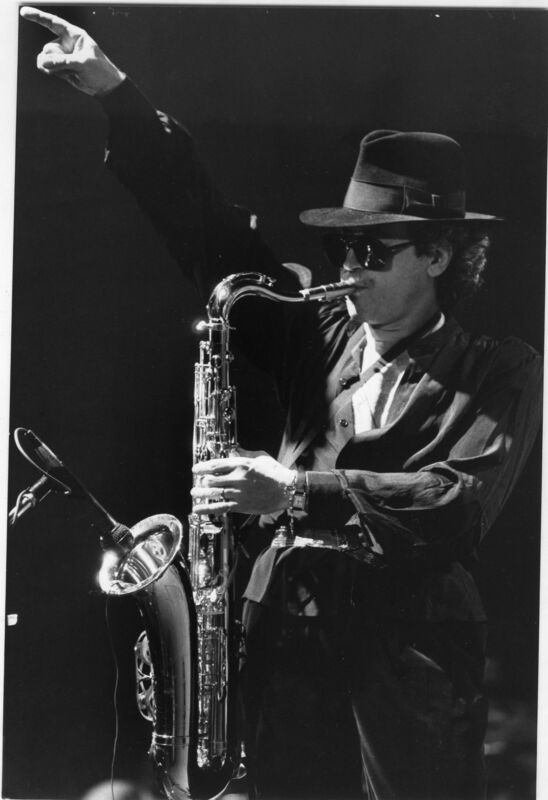 In 1996 Gato Barbieri married his wife Laura and they soon had Christian, their son. 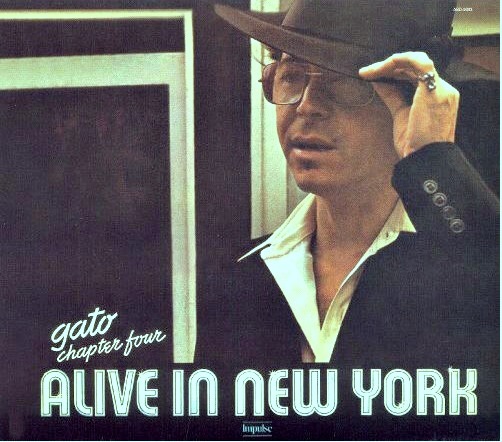 After Gato’s death on April 2, 2016 at 83 years old, Laura Barbieri told The Associated Press: “Music was a mystery to Gato, and each time he played was a new experience for him, and he wanted it to be that way for his audience.” This photo is from 2000. 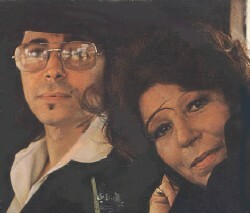 Gato Barbieri and Italian-born wife Michelle. Married in 1960 they moved to Rome in 1962, where Gato began collaborating with American jazz trumpeter Don Cherry (1936-1995). This photo was taken in New York City 1974. 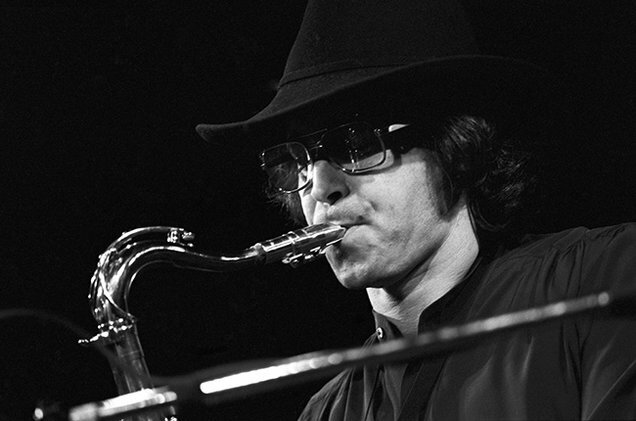 Gato Barbieri’s free-jazz playing in the late 1960s and early 1970s along with his audacity to blend the improvised style with a cutting-edge mining of Latin jazz in multi-artist projects attracted Italian film director Bernardo Bertolucci to recruit Barbieri to compose the score for his 1972 film Last Tango in Paris starring Marlon Brando and Maria Schneider. Bertolucci was seeking his own musical blend from the young Argentine musician who could incorporate jazz, strings, and tangos into his score to embody the film’s chaos of spirit and ferocious sexuality with a nod to European intellectualism and Hollywood popularity. 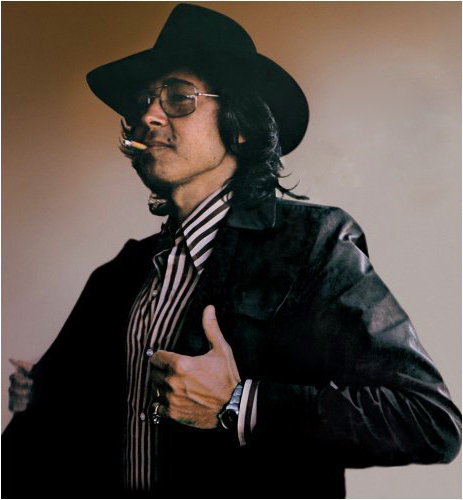 Gato’s musical score became an instant international sensation and professional triumph for the 41-year-old musician winning a Grammy Award for best instrumental composition in 1973. Fireflies is the lead track from Gato’s best-selling Caliente! album for A&M 1976 produced by Herb Alpert. 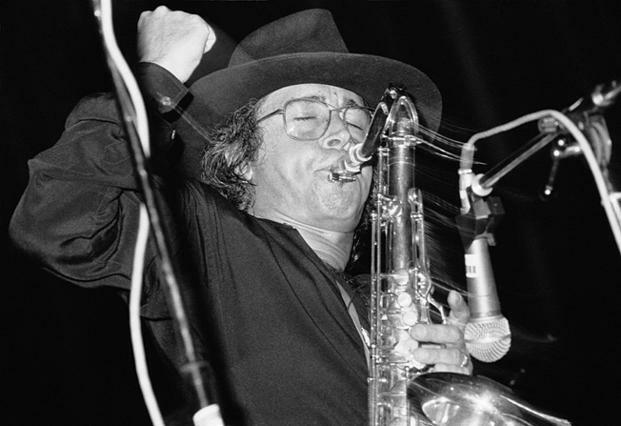 Released at the beginning of the peak of the jazz-fusion and disco eras, Gato Barbieri plays with sizzling heat relying on tango-infused Argentine fluency and as well as the influence of Sonny Rollins (b.1930), John Coltrane (1926-1967) and Pharoah Sanders (b. 1940). 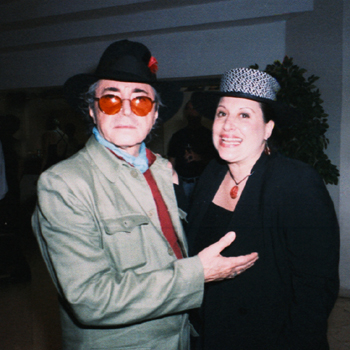 “Always in the tango is tragedy,” said Barbieri in 1997. “She leaves him, she kills him. It’s like an opera – but it’s called tango.” Caliente! 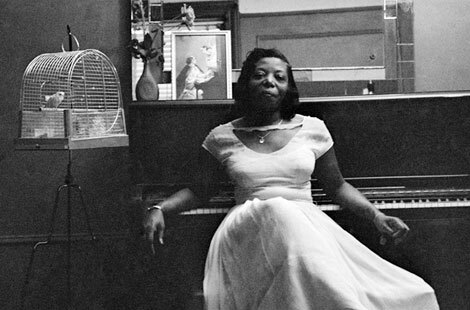 is beautifully arranged and executed which makes for enjoyable listening. The concept of strings combined with rhythmic danceable funk anted up Barbieri’s raucous sound and made Caliente! 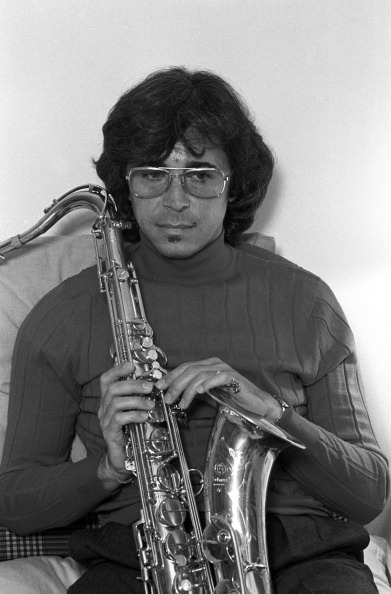 a successful primogeniture to Herb Alpert’s instrumental Rise in 1979 which became a very big international hit. This entry was posted in Music and tagged A&M Records;, Abdullah Ibrahim, Airto Moreira, Bernardo Bertolucci, Blue Note club, Bo Stief, Carla Bley, Charlie Haden, Chico O’Farrill, Don Cherry, Flying Dutchman, Gato Barbieri, Herb Alpert, John Coltrane, Karl Berger, Last Tango in Paris, Latin Grammy Lifetime Achievement Award, Lonnie Liston Smith, Maria Schneider, Marlon Brando, Pharoah Sanders, Shadow of the Cat, Sonny Rollins, Stanley Clarke, Steve Lacy on October 30, 2016 by jwalsh2013.